"This was the day to mark the lambs and shear the sheep. The wool was shipped to wool markets in Elizabeth City, or Norfolk, Virginia. The sheep owners reaped a handsome profit from the sale of their wool. "Many families owned no sheep and had no wool. During the night, sheep roamed and nipped the tender leaves from low bushes and shrubbery, and would leave a large quantity of wool entangled in the shrubbery. In the early morning, the families that had no sheep would send their children through the woods picking wool from the bushes that the sheep had left during the night. 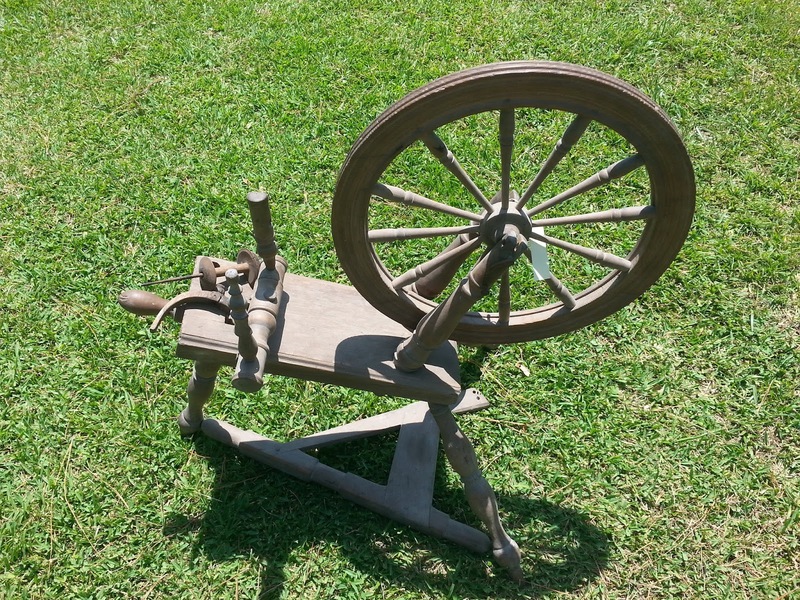 "Some older women owned old-fashioned spinning wheels. They would card and spin this wool into yarn thread on a fifty per cent basis." A hand-made wooden cross rests on the altar in the sanctuary of the Ocracoke Methodist Church. The cross was constructed by Homer Howard, and painted gold by his wife, Aliph. 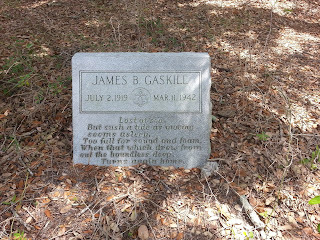 The cross was made out of salvage from the ship on which island native, James Baughm Gaskill (1919-1942), served and lost his life. The cross stands today as a memorial to James Baughm Gaskill, 3rd mate in the USS Maritime service. Jim Baughm's ship, the Caribsea, was torpedoed and sunk off shore by a German U-boat on March 11, 1942. Shortly after the sinking, Christopher Farrow, James Baughm's cousin, found his framed license cast up on the ocean beach. Later, the ship's nameplate and other debris washed up at his family's dock, at the old Pamlico Inn. 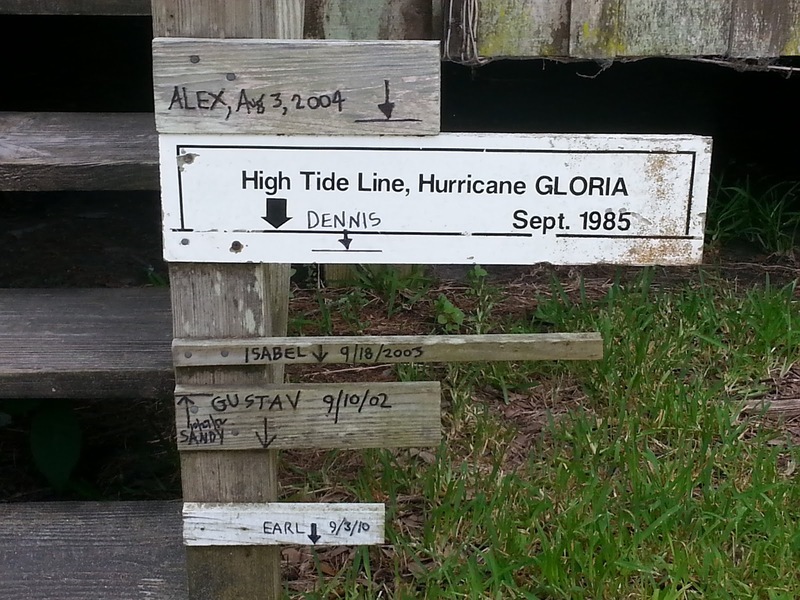 Although Jim Baughm was lost at sea, and his body never recovered, his family erected a marker in the family cemetery behind the lighthouse. The epitaph is a quotation from Alfred Lord Tennyson's poem, "Crossing the Bar." Last month I mentioned the Outer Banks wild ponies. Visitors to the island often wonder how these small horses traditionally found water to drink. After all, there are no fresh water streams, ponds, or springs on Ocracoke. 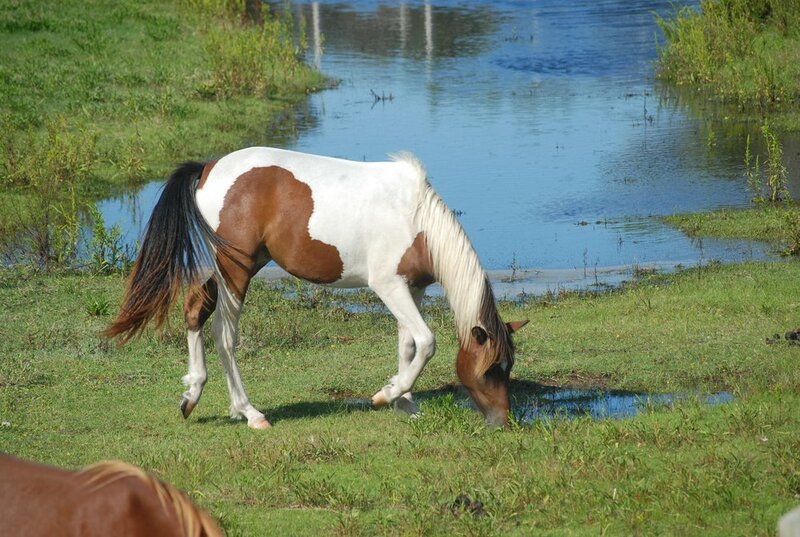 Besides, marsh ponies eat great quantities of salt marsh grass, so they need to drink water about every three hours. 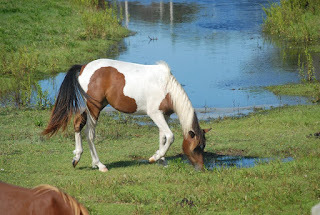 Sometimes, of course, rain puddles provide fresh water for the ponies. When that source of water is not available the horses have learned to dig drinking holes by pawing at the sand with their hooves. They tap into the rainwater runoff that is stored in a shallow "freshwater lens" that floats above brackish underground water. I just finished reading David McCullough's new book, The Wright Brothers. It is a fascinating account of two men who had intelligence, mechanical abilities, perseverance, and above all, vision. As we know, on December 17, 1903, Wilbur and Orville Wright, from Dayton, Ohio, made the first ever piloted machine that took off under its own power, achieved full flight, continued forward with no loss of speed, and landed at a place as high as that from which it started. And they accomplished this remarkable feat, the beginning of the age of flight, at Kitty Hawk, on the Outer Banks of North Carolina. McCoulough recounts the many 19th century scoffers who declared unequivocally that "man will never fly." And he quotes portions of an 1869 poem that ridicules the attempt to soar like the birds. I had never heard this delightfully comic poem. Below is the first stanza. For those interested I quote the entire poem at the end of this post. Enjoy! Darius Greene and His Flying-Machine (1869) by John Townsend Trowbridge, 1827-1916. An' I'll back down, an' not till then!" The fust idee that's big an' grand." "An' now," says Darius, "hooray fur some fun!" An' practise a little on the wing." "Ain't goin' to see the celebration?" O' this jumpin,' thumpin' pain 'n my head." An' I'll try to race 'ith their ol'balloon!" "I'm gittin' over the cold 'n my head." "What is the feller up to, hey!" Ur he wouldn't 'a' stayed tu hum to-day." Says Burke, "His toothache's all 'n his eye! Ef he hedn't got some machine to try." Then Sol, the little one, spoke: "By darn! "Say, D'rius! how do you like flyin'?" O' fun in 't when ye come to light." For fifty years I have kept a copy of Mutiny on the Bounty on my book shelf...but never read it. A few days ago I spied the entire trilogy (Mutiny on the Bounty, Men Against the Sea, and Pitcairn's Island), and decided I must read these classics. The pages are yellow and brittle, but the books are wonderfully written. In chapter IV ("Tyranny") of Mutiny on the Bounty I came across this paragraph: "We had supped and were passing the time at Ablewhackets—a game I have never seen played ashore. It is commenced by playing cards, which must be named the Good Books. The table is termed the Board of Green Cloth, the hand the Flipper; the light the Glim, and so on. To call a table a table, or a card a card, brings an instant cry of "Watch," whereupon the delinquent must extend his Flipper to be severely firked [beaten or struck] with a stocking full of sand by each of the players in turn, who repeat his offense while firking him. Should the pain bring an oath to his lips, as is more than likely, there is another cry of "Watch," and he undergoes a second round of firking by all hands. As will be perceived, the game is a noisy one." I had never heard of Ablewhackets, but imagined my ancestors playing the game aboard sailing ships. I wondered what the rules of the card game were. I discovered several descriptions of the procedures, but no explanations of the game itself. "ABLE-WACKETS. 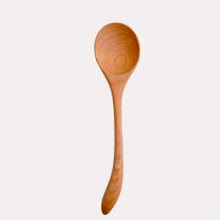 blows given on the palm of the hand with a twisted handkerchief, instead of a ferula [a flat ruler with a widened end, formerly used for punishing children]; a jocular punishment among seamen, who sometimes play at cards for wackets, the loser suffering as many strokes as he has lost games." (From the 1811 Dictionary of the Vulgar Tongue by Capt. Grose). This is what I learned from http://www.worldwidewords.org/weirdwords/ww-abe3.htm: "None of the many descriptions explain the card game itself. Though it was clearly of secondary importance in the gulling of the unwary, it must have had some rules, but we’re never told what they were." I have come to believe that ablewhackets could be played with many different card games. Perhaps innovative versions were created regularly as sailors whiled away long hours at sea. "And each of them had a hand of cards, and a length of knotted rope-yarn, and they were playing able-whackets. Each man in turn put down a card, and swore a new blasphemy, and if his swear didn’t come as he played the card, then all the others hit him with their teasers." I suppose this is more than any of our readers wanted to know about ablewhackets (the name probably derives from "able-bodied seaman" [a rank in the merchant marines] and "whack" [to strike forcefully with a sharp blow]), but it is an entertaining glimpse into nautical history. In the mid-1950s Ken Burke made his first visit to the Outer Banks. He was a sophomore at the University of Richmond, and was on semester break. He and a buddy got their car stuck in the sand "just below Virginia Beach" and had to be pulled out by a Coast Guard bulldozer. At Oregon Inlet they slept on the ground (it was sleeting), waiting for the ferry next morning. Not until the next year did Ken and his friend venture all the way to Ocracoke. Highway 12 had not yet been built on Ocracoke, so they planned to walk from Hatteras Inlet to the village. Fortunately, a Coast Guardsman offered them a ride in his 4-wheel-drive vehicle. Ken relates that, "Interestingly enough, as we went down the beach, there were cattle actually standing in the surf. Not ponies, but cattle." 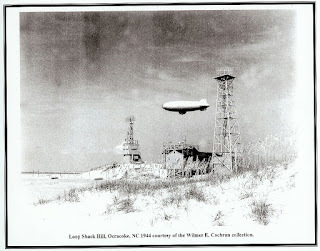 A fall storm ("coming out of the southwest") forced them to find shelter in the "old USA Navy concrete lookout tower for submarines [see photo below]." 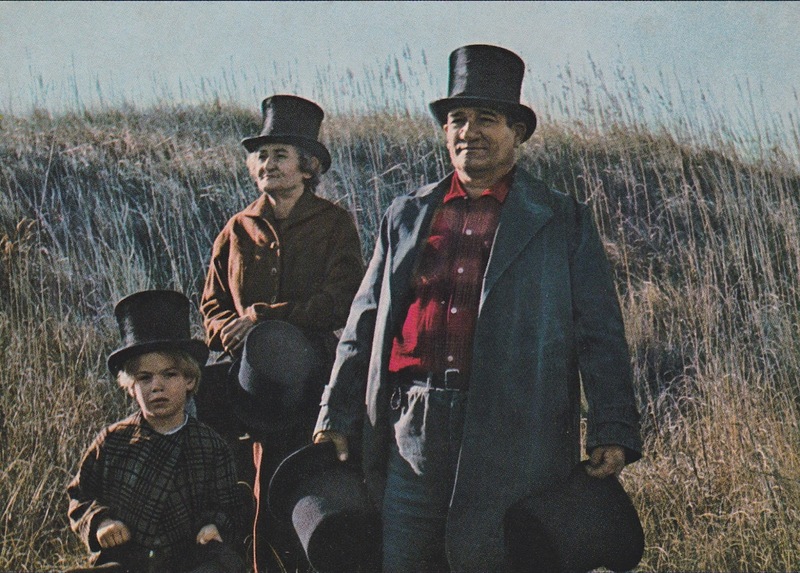 The next day they walked into Ocracoke Village. But Ken had heard about Portsmouth Island, and he was determined to get there. In April of 1957 he and two more friends returned to Ocracoke. They booked passage on the mailboat Aleta, and were met in the channel by Tom Bragg who introduced them to Portsmouth. They spent three days, the beginning of his love affair with that most isolated Outer Banks village. You can read Ken Burke's 1958 Honors Thesis, "The history of Portsmouth, North Carolina, from its founding in 1753 to its evacuation in the face of federal forces in 1861," here: http://scholarship.richmond.edu/cgi/viewcontent.cgi?article=1410&context=honors-theses. Many people are unaware that Outer Bankers engaged in whale and porpoise fishing as recently as 1926. You can read about these enterprises in our latest Ocracoke Newsletter at http://www.villagecraftsmen.com/news082115.htm. You will even learn why the island's northernmost creek is called Try Yard Creek. This past weekend Amy, David, Lachlan, and I were enjoying a beautiful Sunday afternoon at the South Point. 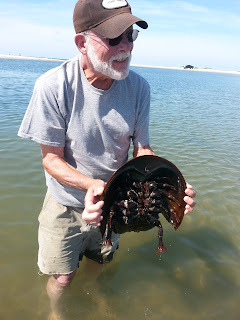 Lachlan was exploring the edge of a deep pool connected to the ocean when he shouted for me to come see a large horseshoe crab. David took this 31 second video of the giant arthropod making his way back to deeper water. Last week I accompanied a group of folks for a sunset cruise on the Skipjack Wilma Lee. On the way back to Silver Lake, with the sun setting behind the boat, I had a pleasant conversation with Crystal & Ty, a young couple from Wilmington, NC, who had never been to the island before. Ty made this panoramic image of the Wilma Lee with his smart phone, and was gracious enough to share it with me. Click on the picture to see a full size image. For more information about the Wilma Lee and sunset cruises, click here: http://www.ocracokealive.org/skipjack-wilma-lee.html. A number of roads, creeks, cottages, and businesses on Ocracoke are named after prominent islanders. Among others, they include Irvin Garrish Highway, Old Quawk’s Creek, Howard’s Pub, Lawton Lane, Sarah Ellen Drive…and many more. Starting today I will periodically be writing blog posts about the folks memorialized in the names of these island landmarks. Today I have chosen to write about Elsie Ballance Garrish. Many of our readers will have noticed “Elsie’s House” a small historic cottage on Howard Street. This was the home of EIsie Garrish and her husband Irvin (more about Mr. Irvin in a future post). 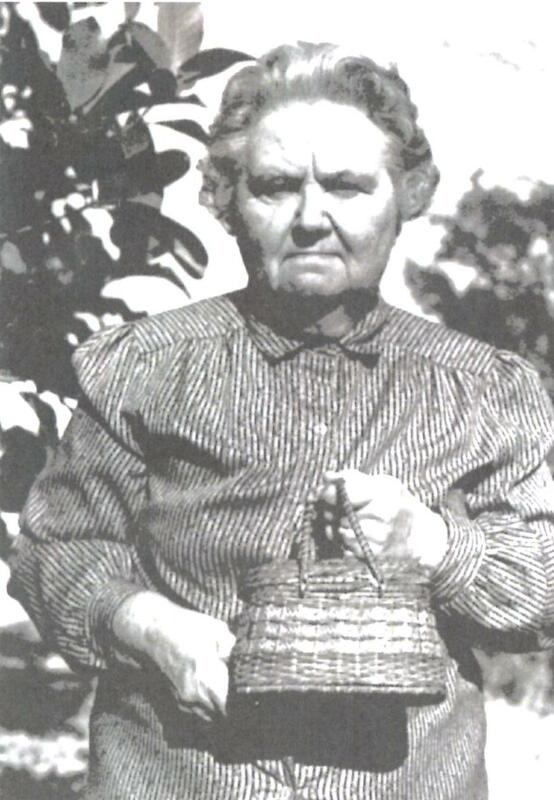 Elsie Dean Ballance was born January 4, 1915, the daughter of Elisha and Emma Balance. She was the eldest of nine children. 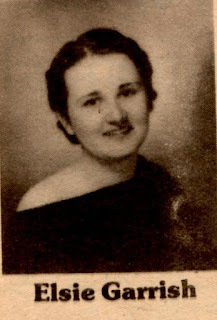 As a young woman, Elsie left the island to attend nursing school at Rex Hospital in Raleigh. She graduated as a Registered Nurse in 1938. In December of that same year she married another islander, Irvin Garrish. Although Irvin’s work took them up north for a while, the couple eventually returned to Ocracoke. At that time Ocracoke was without a doctor, so Elsie devoted herself to providing health care for her friends and neighbors. She delivered a number of babies, administered hundreds of tetanus shots, and stitched up many a wound. Miss Elsie lived to see the establishment of a Health Clinic on Ocracoke Island. Thus, with a paid doctor or other health care provider in residence, Elsie could devote more time to her family and other community and church activities. Elsie Garrish died January 23, 2003. She was 88 years old. Her two daughters and their families continue to live on the island. When you pass “Elsie’s House” on Howard Street, remember this dedicated public servant who provided health care and “plenty of TLC” to our island community. 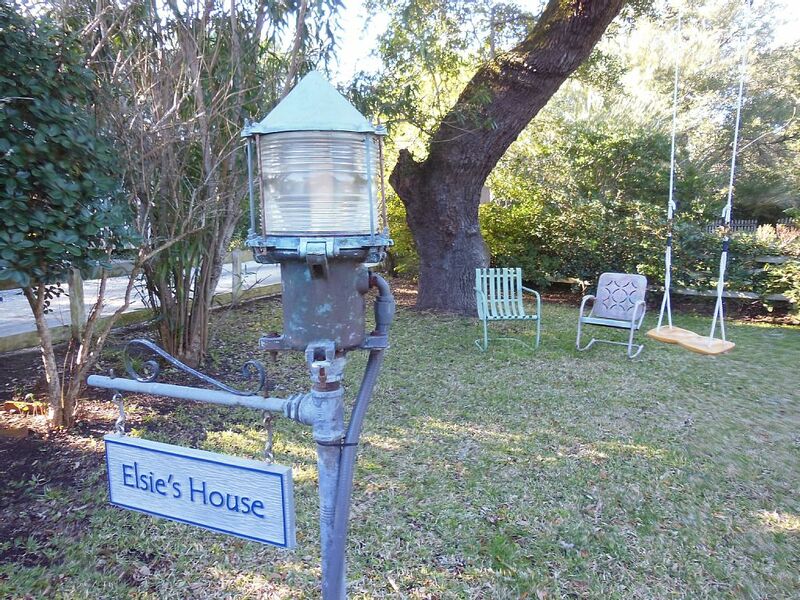 Elsie's House is now a rental cottage. More information is available here. 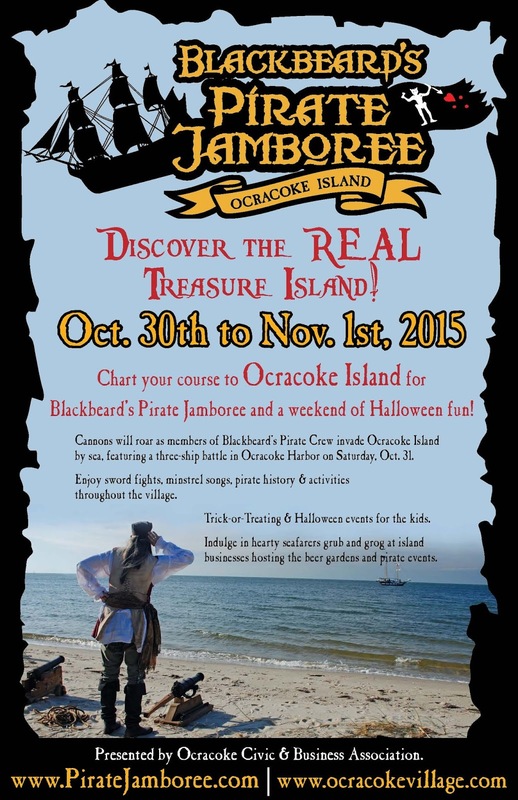 Ocracoke is getting ready for another pirate invasion, so chart your course for the island. 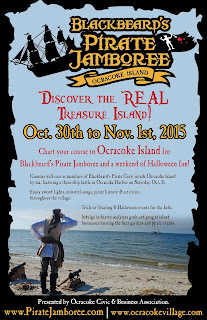 Blackbeard's Pirate Jamboree will be held October 30 - November 1. This year the festivities will coincide with Halloween. In addition to Trick-or-Treat events for kids, the festival will include pirate re-enactors, buccaneer encampments, naval battles, sword fights, minstrel songs and sea chanteys, good food, and grog. For more information click here: www.PirateJamboree.com. Anyone who has been coming to Ocracoke for some time is familiar with our mosquito population. Although they can, at times, be quite a nuisance, much depends on weather and rainfall. Dry and/or windy conditions can significantly cut down on their numbers. In addition, Ocracoke has a mosquito control program that is very effective. In fact, mosquitoes have not been much of a problem this season, although I have noticed a few recently. Pat Garber has written a chapter in her book, Ocracoke Wild, about mosquitoes. I found these statistics fascinating: "These tiny creatures weigh so little that 25,000 would be required to make an ounce. They are capable of flying 30 miles per hour, beating their wings 400 to 600 times per second." Pat also points out that mosquito "larvae provide an important food source for hatchling fish and shrimp...as well as for turtles, frogs, and water insects. 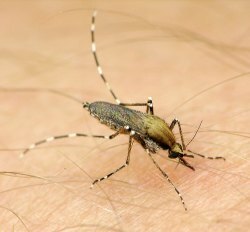 Bats, swallows, spiders, and dragonflies rely on the adult mosquitoes for sustenance.... If humans were to successfully eliminate mosquitoes (a highly unlikely possibility), they might eliminate a good proportion of our fisheries and wildlife." You can read more about Ocracoke's mosquitoes in this 2012 article by Jenny Scarboroguh in the Ocracoke Current or in this 2013 article by Connie Leinbach in the Island Free Press. I met Katie & Kendall after our Ghost & History Walk two weeks ago. Katie's s great-great grandfather, William Toler (born 1830) had lived on Ocracoke. He was lost at sea in 1888. A grave marker was erected in the family cemetery. His daughter, Lettie, married a man from Swan Quarter, and the family soon moved off the island. Katie and her daughter Kendall, who live in Currituck, NC, asked me if I knew where William Toler's grave was. After a bit of research I felt sure I knew where he was buried. I'd been there before. "It is back in the woods, far from the paved road," I told them, "but if you would like to see it, I will take you there." They readily agreed, and we met the next morning at 9 am. The path to the graveyard was much more overgrown than the last time I had been there. There was hardly even a path. We stepped off the pavement, and almost immediately found ourselves chest deep in thick marsh grasses. Soon enough the path disappeared completely, and we entered a dense thicket of myrtles, vines, thorns, and other vegetation. Our way was repeatedly blocked by fallen trees, heavy, low-hanging branches, and lush patches of poison ivy. Eventually we stumbled upon a timy Scarborough family cemetery. There was no fence, just a few stone markers in what was once a small clearing. This was not the graveyard we were looking for. I almost despaired of ever again finding William Toler's grave, but I persevered. Pushing through more tangles of vines and thorns, I made several false starts, only to find my way blocked. Finally I made a bit of headway, and spied a short portion of an old wooden fence. Other sections had rotted away at the base, and had fallen on the ground. Nearby were several stone markers. This was what we were seeking. I called back to Katy and Kendall who were making slower progress. Gingerly stepping over roots, dead branches, sharp thorns, and poison ivy, the two women entered the graveyard. 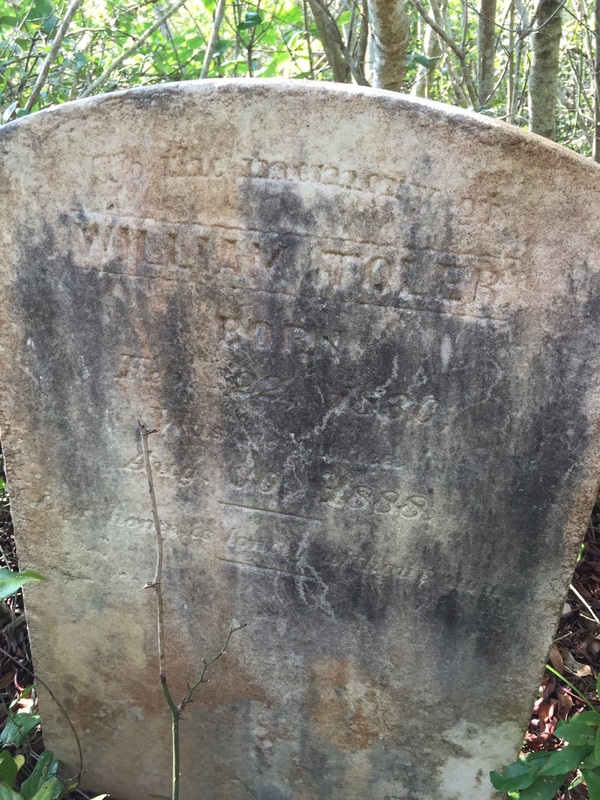 William Toler's gravestone was on the edge of a dense thicket, and badly weathered. We took a couple of photos since Katy & Kendall doubted they would ever venture back there again. The headstone reads: "To the Memory of William Toler Born Feb. 28, 1830 Drowned at Sea Aug. 30, 1888 Our home is lonely without you." We couldn't find the same way back out to our car, so we struggled through more underbrush, thorns, wet bogs, tall grass, and thick vines. 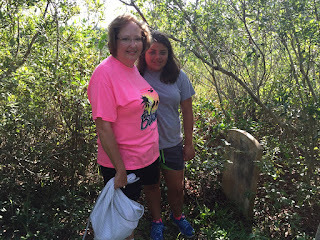 In spite of the difficulties, Katy and Kendall thanked me for leading them to their ancestor's gravestone (we didn't mention snakes or ticks until we were back to the pavement!). Katy and Kendall will return home with stories of an adventure And they visited a part of Ocracoke seldom seen by visitors or even residents. Back home I wiped the dozens of scratches on my legs with rubbing alcohol, showered thoroughly to wash away the dirt, grime, and poison ivy oils, then re-treated my wounded legs with more rubbing alcohol. Next time I plan to wear blue jeans! Every now and then I mention clamming in this blog, but I seldom take any photos when I am out in the Sound. Earlier this week I took friends out to rake a few clams. Erin Jones took these pictures. ...and broiled them for about 15 - 20 minutes. When I brought them to the table, they didn't last long! Cousin Blanche constantly amazes me. I was sitting on her pizer a couple of days ago, and the conversation turned to the Wright Brothers and how they persevered while others were giving up on the dream of conquering the air. That reminded Blanche of a poem she had memorized decades ago. She sat across from me and recited the poem in its entirety! Not bad advice, I'd say. Thank you Blanche for again brightening my day! I just realized that for 2 1/2 weeks I have had the incorrect link at the bottom of my blog. This month's Ocracoke Newsletter is the story of the "Stovepipe Hat Wreck" (not "Rum Running on the Outer Banks"...that was June's Newsletter). I loved hearing the story of this 1867 wreck and the thousands of top hats that Hatteras islanders salvaged from the beach. So I began an investigation. I was surprised about what I learned. If you haven't already read the Newsletter, please click here for the full story: http://www.villagecraftsmen.com/news072115.htm. 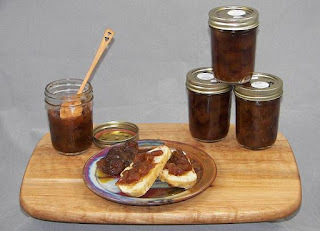 Yesterday I mentioned Ocracoke Island fig preserves that are available for sale at Village Craftsmen.Today I want to alert all of our readers to the 2nd annual Ocracoke Island Fig Fest to be held August 14. Festivities start at 1 pm at the Community Square, with local vendors displaying and selling all things fig related -- cookbooks, preserves, fig trees, and more. At 2 pm Chester Lynn, the island's fig expert, will give a presentation on figs (he will even have figs to taste). At 3 pm bakers will display their fig cakes (either traditional or innovative). Judging begins at 4 o'clock with North Carolina restaurant reviewer, food writer, and TV personality, Bob Garner. Free samples will be available after the judging. Festivities continue into the evening with a traditional Ocracoke Island square dance at 6 pm, awards at 7 pm, and a dance hosted by the Ocracoke Rockers from 8 - 10 pm. Figs are abundant on Ocracoke, and many island residents are busy this time of year putting up preserves. In 2014 Hurricane Arthur (July 4) nearly destroyed fig production. So far this year we have seen a bumper crop. As a result, Village Craftsmen again has preserved figs for sale. Fig preserves are tasty spread on your morning toast, are the main ingredient in a delicious island cake (http://villagecraftsmen.blogspot.com/2005/08/island-fig-cake.html), make a popular appetizer when served with goat cheese, and are included in many traditional and innovative recipes. We have a new supply of this year's fig preserves in pint and half pint jars, ready to ship immediately. Order your fig preserves here: http://www.villagecraftsmen.com/figpreserves.htm. You will be glad you did! Cousin Dallie stopped by Friday morning with a small critter in a jar. This is what Wikipedia has to say about this caterpillar: "The inch-long larva is generously coated in long, luxuriant hair-like setae, making it resemble a tiny Persian cat, the characteristic that presumably gave it the name 'puss.' It is variable in color, from downy grayish-white to golden-brown to dark charcoal gray. It often has a streak of bright orange running longitudinally. "The 'fur' on early-stage larvae is sometimes extremely curly, giving the larva a cottony, puffed-up look. The body tapers to a tail that extends well beyond the body, unlike its relative M. crispata. The middle instar has a more dishevelled [sic], 'bad-hair-day' appearance, without a distinctive tail. 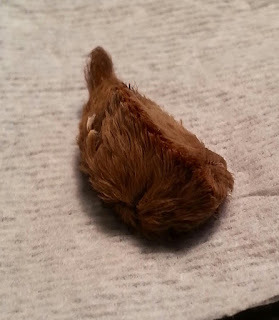 The 'fur' of the larva contains venomous spines that cause extremely painful reactions in human skin upon contact. The reactions are sometimes localized to the affected area but are often very severe, radiating up a limb and causing burning, swelling, nausea, headache, abdominal distress, rashes, blisters, and sometimes chest pain, numbness, or difficulty breathing. Additionally, it is not unusual to find sweating from the welts or hives at the site of the sting. Ironically, the resemblance of the larvae to soft, colorful cotton balls encourages people to pick them up and pet them." You have been warned. Beware of the Puss Caterpillar. They can be found throughout the South, and now we know they reside on Ocracoke. "Gusts at the Ocracoke ferry office were reported to be as high as 120 mph. Sustained winds were probably 80-100 mph. But the biggest surprise was the tide. After noon today the wind shifted and brought some of the highest tides Ocracoke has ever experienced. Older residents report that only in the 1944 storm was the tide up so high. Numerous homes had water in them, some as deep as several feet. Residents of the Jackson Dunes area reported water as deep as 6-7 feet. On Howard Street the tide came in 6 inches higher than hurricane Gloria in 1995. The next day I wrote, "Everyone is safe and there is no major damage on the island. However, everything is a mess. Wood, branches, propane tanks, etc. are scattered all over the village. Water is still standing in low places. Boardwalks and some docks have floated across lawns and roads. At least one vehicle was totaled when a tree fell on it. Two cars burned up when the owners tried to start them after the flood." Because the storm intensified so quickly, no evacuation was ordered. As a result, hundreds of vehicles were destroyed by flood waters. One rental house burned when a car parked underneath shorted out and caught fire. Perhaps some of our readers will want to leave comments about their experiences during Hurricane Alex.